Black takes a new consulting gig with the LAPD, helping them find a contract killer who left a dead body behind the Los Angeles Theater. Despite Miri’s lingering fears after what happened to him during the last murder case he worked, he assures her it’s routine, that he won’t be doing fieldwork, that nothing could possibly go wrong. Then, during his first night on the job at the Port of Los Angeles, all hell breaks loose and all bets are off. Black wakes up in a nightmare he couldn’t have foreseen, with no way out and no idea how he got there. Robbed of his psychic sight, he can’t even call to Miriam for help, or use his abilities to figure out where he is, who took him, or what they want from him. On the outside, Miri is frantic, working with the police and Black’s team to find him. She has even less information than Black… until a confession from her Uncle Charles brings her face to face with a much older enemy, the same enemy that may have killed her entire family. BLACK AND BLUE is book five in the QUENTIN BLACK MYSTERY series, a paranormal mystery series starring brilliant but dangerous psychic detective, Quentin Black, and his partner, forensic psychologist Miri Fox. It’s also a spinoff of the BRIDGE & SWORD SERIES. 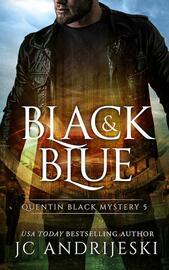 Black To Dust (Quentin Black Mystery #7) - Coming Soon!